CSF is now accepting nominations for the Seymour Award. 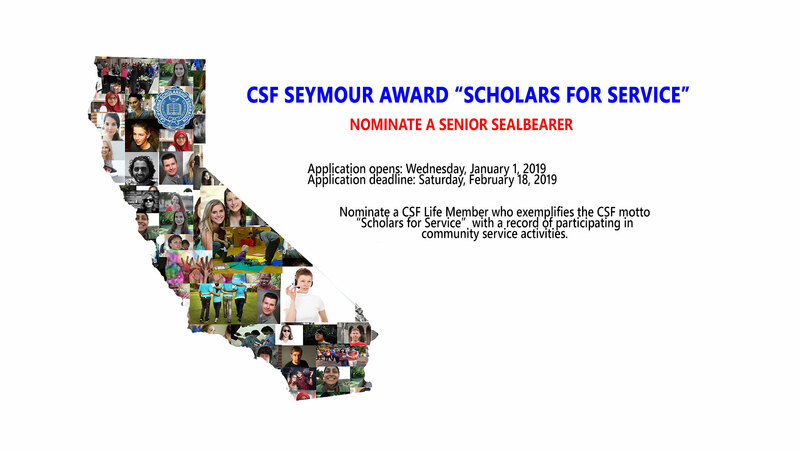 You are invited to nominate one or two CSF Sealbearers for the Seymour Award, one of the highest scholastic honors given to high school students in the state of California. We will be looking for those Sealbearers who best personify the CSF motto, “Scholars for Service.” The selection will be made on the basis of character, leadership, and service. Over $100,000 will be awarded to a group of 50 graduating Sealbearers. Get all the details on our website. Students must be nominated by their CSF Adviser using the online nomination form. Nominations open: January 1, 2019. Nomination deadline: February 18th, every year. Nominees must attend their Region’s Spring Conference – see Calendar – to be considered for the financial award. Advisers were emailed the password to access the online nomination form. Chapter dues must be current through 2018-19 school year, Course Lists submitted and approved 2018-19 school year.